The Audio-Technica ATR2100-USB is one of its kinds when it comes to the microphone market segment. The Microphone stands apart in the crowd because of its capability to make different connections. While it is a bit expensive to make an XLR microphone work with any computer, ATR2100 makes it very simple via USB. An even more better news is its compatibility with Windows XP, Vista, Windows 7 and Mac Operating systems. When this mic is connected to XLR camcorder (capable) or XLR sound mixer, this mic works as a dynamic mic. The power consumed by this mic is also very less. If this mic is used in a studio, then the headphone monitoring feature of this mic is very helpful. If any 1/8” jack headphone is available, just plug-in and monitor the recording on the mic without any delay. How is the Sound Clarity? For any microphone, this is the primary quality. In ATR2100, this characteristic is simply great. The frequency response of this microphone is extremely good between 50 Hz and 15,000 Hz. So, whether it is deep or high, it allows for an excellent pickup of sounds. If the sounds are at the extreme ends of the scale – which can’t be heard by human ears – then these aren’t the microphones for you. Audio-Technica has won a lot of industrial awards for quality, durability and performance. The ATR2100 is becoming a standard microphone for podcasters as it sounds fabulous with all the qualities a podcaster would desire. The sound quality and the dual output are certainly great features that need a mention here. The real strength of the Microphone lies in its good frequency response, Durable, professional look and feel and its versatile connectivity. Let us review the key highlighting features of the ATR-2100 microphone. Ports: The ATR2100 has three ports at the base of the mic – mini USB, XLR connector and headphones. Though this mic is suitable for using it with the USB connection, the XLR output increases the versatility of the mic. The XLR connector makes the mic compatible with more audio interfaces and with PA system also. When the USB connector is used and the mic is plugged in, the sound output is routed to the microphone and can be listened through the headphones. Build: The microphone is durable in terms of build. The body of the mic is made from heavy-duty die-cast aluminium. The capsule at the inside is protected by a windscreen and steel mesh. The durable build ensures long lasting performance. Dynamic Cardioid Pattern: The Cardioid Polar pattern helps in reducing the pickup of unwanted sound from the background. Thus, this microphone is suitable to use across podcasting, live performance, studio recording, field recording and on-stage use. The directionality of the mic helps to pick sounds that you want more and eliminates the sound not needed. But one should remember that pointing it at the sound resource is very important to capture the clear sound. Weight: The weight of the microphone is just 9.5 oz making it light. Output:The USB output connects to the computer for digital recording of sound. The XLR output connects to the sound system’s microphone input for live performance. Tripod Stand: The tripod stand is light-weight. It is designed with folding legs for an easy portable tabletop use. There is a threaded stand clamp provided with the kit attaches to the tripod stand or to any other conventional microphone stand. Compatibility: The microphone is compatible with both Windows and Mac. Blue Light: There is a blue LED light in the MIC and when it is plugged via USB, this LED lights up. It is so bright that one can even use it as a small flashlight. With all the above features, the sound quality and the price range, ATR2100 really can’t be a wrong choice for anyone in search of a good mic. The ATR2100 is a microphone that is certainly more than worth for its price. Not only that, it is inexpensive, durable and an easy to use microphone. It is a perfect microphone for digital storytellers and podcasters. There are some cons you need to consider while reviewing the microphone for purchasing. Though there is nothing much when it comes to the negative points of the phone, here are few that needs to be noted. Like all the other dynamic phones, this microphone records the sound quietly. This might sometimes create a fuzzy sound in the background of the recording. But this can easily be removed during the post recording session. This is a low range microphone. Hence, one need to be fairly get close to the mic for better sound during recording. The tripod stand is made to be light-weight. But sometimes it feels like it is a bit flimsy for use. One needs to use it with care. There are certainly certain points that are worth noting. The advantages listed below are fair enough to highlight its quality. The most important advantage of the ATR2100 is its sound quality. The sound is so clean and the background noise is next to nil because dynamic microphones are less sensitive than condensers. The setup of this microphone is very easy. There is a separate headphone jack on the mic with volume control for monitoring. The number of ancillary parts one need to buy for this microphone is very less. The microphone is shipped along with a tripod, microphone clip, USB cord and XLR cord. For both USB and Analog operation, there are on/off switch functions enabled. Usually, most of the mics are turned on/off through the computer interface. But the physical switch provided in this mic is quite useful when connected to a PA system. The Warranty is unmatchable. It has a LIFETIME warranty. Above all the other advantages, the most important advantage is its cost. While there are other microphones in the market with similar capabilities, this is an excellent choice as it is flawless and an inexpensive one. 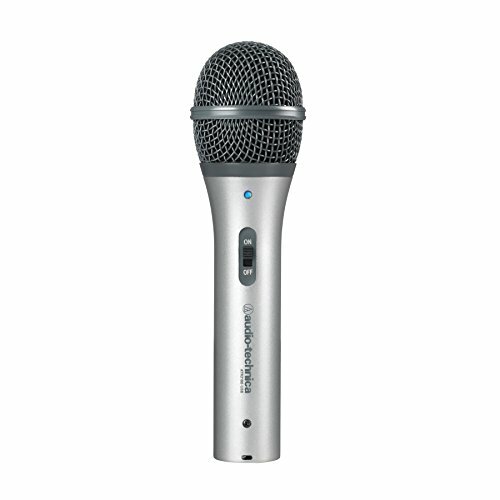 Priced at less than $60, it is a microphone available for the best value at the entry level. Among the USB microphone competitors, the ATR2100-USB Audio-Technica USB/XLR microphone steals the show. The mic is certainly the one that is lower in price than the others of the same categoryand too good in terms of performance for the price paid. Since it has both USB and XLR output, it is convenient to use it as a plug and play USB mic. At the same time, it has the versatility of an XLR mic. The sound quality is perfect but as per the specs, the frequency response is 50Hz. Hence, it might not be suitable for musicians who are looking for a mic. The mic certainly can handle the job but it is more suitable for podcasting, online tutorials and voiceover use. It easily picks up the small variations in the voice as the pitch goes up and down. This quality of the microphone is good because the voice sounds more natural. On a final note, this is a dynamic microphone and is exceptionally suitable for use in studio. The look and feel of the phone, the features with professional touch makes it the most preferred microphone among the lot. Review of the TOP 5 Vocal Mics at THIS page! 1 How is the Sound Clarity?